JOS MINI IMPORTATION BUSINESS MASTERCLASS. Coming up on Saturday, 15th December, 2018. Online Mini importation business, starting with little or no capital! This seminar/workshop is For Students (with ID card), Corpers, Working Class, Professionals, Applicants, Civil servants and everyone willing to get extra and additional income source. REGISTER FOR THE UPCOMING SEMINAR HERE! - The whole story of how I started my online importation business. 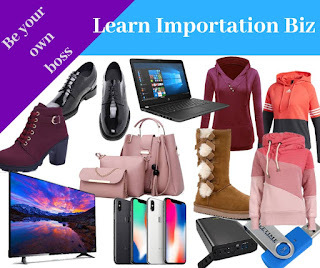 - How to start your own Mini importation business from scratch with only N5,000 and turn it into a continuous cash generating income! - The 4 Reliable Websites to import from and those you shouldn't! - How to start importing very cheap items for a low as N5,000 and sell for high profits. anyday that will always SELL LIKE CRAZY! - The Dos and Don't of Mini Importation business. - The different methods to market and sell your imported goods online and offline. - You would be added to our closed WhatsApp group and Telegram group for ongoing support and guide. Dont' forget, this Mini Importation Seminar comes up on Saturday 15th, December 2018. Time:11-4pm. Participants will enjoy FREE BONUS PACKAGES. You stand to get the following FREE e-packages just to say thank you for coming to the seminar. 1. How to Start your own Internet Data Business in Nigeria. You might have seen someone selling data to you. Learn how to start the business yourself and make cool profits selling internet data like others. 2. How to make profits in virtual recharge card selling business. Yes! you resell airtime to people around you! Good for students and workers. No special software to install into your phone before you can do this! 3. How to start Bulk SMS Consultancy business for schools, churches, wedding, birthday parties e.t.c. 4. Blogging and Adsense Blueprint Guide. You learn how to work for Google right from the comfort of your own and earn dollars into your account blogging from your home! 5. Forex Trading e-book for beginners and experts. The Easynews trading strategy e-book. Please bring your PC along if you have one, for the practical sessions. So you can follow us steadily. Limited space available only 100 slots are available for grabs. Firstly, Pick up your phone and let me know you are coming, so I can reserve your seat. You will get a sms from me containing your seat number within 15mins. You can also pay with your ATM/Debit card using our secured payment processor Paystack. Simply sms your name, location and phone number to 08026480369 or 07038844295. You can't afford to miss this workshop for anything!